A Contribution from Sales of this whisky will be made to the Antarctic Heritage Trust (NZ) www.nzaht.org. This will support both the ongoing care of Shackleton's Antarctic base and the Trust's mission to conserve, share and encourage the spirit of exploration; a spirit embodied by Shackleton. In the early years of the 20th century, Sir Ernest Shackleton led one of the most famous expeditions to the Antarctic, overcoming tremendous obstacles to ensure that all of his men returned home safely. That expedition is one of the greatest stories of exploration and leadership in history, and has inspired adventurers across the world ever since. Shackleton ordered 25 cases of Mackinlay's Rare Old Highland Malt Whisky to take on his expedition of 1907. In 2007, eleven intact bottles containing this perfectly preserved whisky were recovered from under the ice beneath Shackleton's base camp. This has inspired our Master Blender, Richard Paterson, to create this Shackleton whisky as a personal and deeply felt project. He has combined the best Highland malt whiskies, allowing them to marry over a long period to create an enigmatic blended malt with a dash of body and a whisper of smoke. 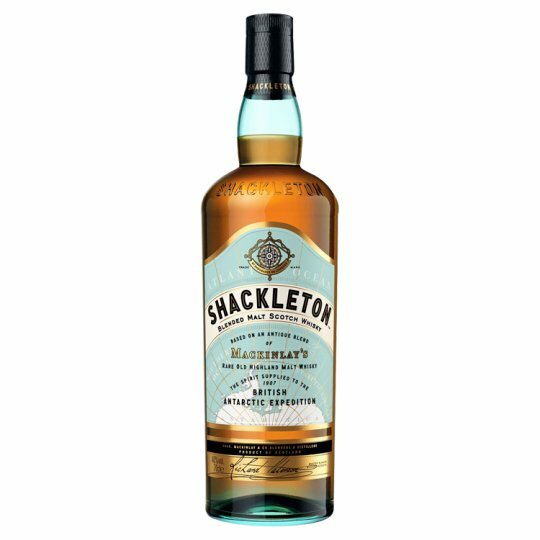 It has complex notes of vanilla, honey and orchard fruits with real warmth and depth at its heart, like Shackleton himself.